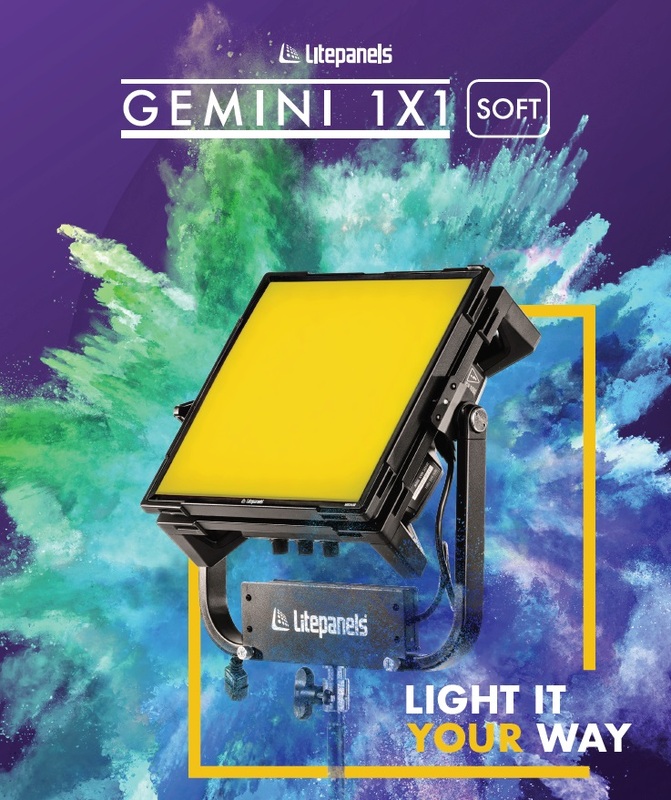 Building on the success of Litepanels’ award-winning Gemini 2x1 Soft LED Panel, the company announced the eagerly anticipated Gemini 1x1 Soft — an all-in-one, cine-quality LED light that is easy to transport and quick to rig in the studio or on location. Gemini 1x1 Soft offers the highly accurate full spectrum white light associated with all Litepanels fixtures and – as a full RGBWW light – delivers every color in the 360° color wheel and plus/minus green adjustment all in a single lightweight, and easy-to-control fixture. Just like its 2x1 predecessor, Gemini 1x1 Soft is truly ground-breaking. Never before have so many robust, high-end cinematic features been packed into a compact, 1x1 form factor. Weighing in at just 11.7 pounds (5.31kg) and with a maximum draw of just 200W, Gemini 1x1 Soft is the industry’s most agile light for filmmakers on-the-go. The compact power supply means that Gemini is fast and easy to rig with fewer cables, users can instantly switch the light from AC power to battery power - using V-Mount, Gold Mount or XLR output batteries – and still retain similar lighting intensity. Gemini 1x1 Soft builds on a foundation of daylight-to-tungsten light providing accurate white light together with flexible and precise colour adjustment. These features make Gemini 1x1 Soft ideal for lighting talent and rendering skin tones, giving users the ability to match a broad range of ambient lighting conditions quickly and easily. Users have total control through four lighting modes: CCT Mode for true daylight and tungsten with fine tuning; HSI Mode to create any color in the 360° spectrum; Gel Mode to dial up many popular gels in seconds; and Effects Mode for a dazzling array of creative lighting effects. Gemini 1x1 Soft is ready to go right out of the box, with no assembly required. In addition to its easy-to-reach onboard controls, the LED offers a broad range of control options, including DMX, wireless DMX, and Bluetooth, for easy integration into an existing lighting setup. It sets new standards for its consistently flicker-free performance at any frame rate, shutter angle, or intensity. The LED provides ultra-smooth dimming from 100 percent to .1 percent with no flicker and without losing color consistency — a critical factor for most television productions. Gemini 1x1 Soft is available now and will be on display for the first time at the 2019 NAB Show in the Vitec Group booth, C5725. A leading system integrator for complex audio-visual systems equipment for various state and private media objects across all Russia and CIS countries.